The author celebrates her 10th year as a New Yorker. I learned early on that I could never be American. I knew I could never tell the story of having been teased by a boy named Jimmy Chestnut who would later give me a Crackerjack ring while eating snow cones after a football game. I didn’t know this when I arrived at JFK and found my Internet lover standing outside the gate beside a large Indian family. I had several romantic scenarios I rehearsed and internalized so intently, probably with the hope that they’d come true. Instead I found myself in a smelly cab behind a plexiglass barrier looking outside the window, deciding that whoever this stranger was beside me, I was going to make a life with her and make this chilly new country my home. I was in my early twenties when I moved halfway around the world, naively thinking I could start over and integrate myself quickly since I was raised on American television, sang Britney Spears songs and ate my share of Trix — just because Jerry Seinfeld said it was his favorite. I believed I was young, educated and smitten enough to make things happen, that even if my vowel sounds were too short and my consonants rolled off too distinctly from my mouth, I would speak and the world would open up to me and the people I would meet would pause to hear what I wanted to say. They paused. They also squinted their eyes and wrinkled their foreheads and said, “What?” To return the favor, I struggled to understand how differently the words sounded from their lips than in music videos and TV shows, often nodding in acknowledgment just to avoid the embarrassing exchange of “I’m sorry?” and “Say that again?” I limited my responses to single words and avoided situations where I had to raise my voice or give long-winded explanations. I pretended to be shy and wrote long emails instead. I was jealous of second-generation immigrants and how they completely shed their parents’ accents and spoke so perfectly, as if their faces didn’t belong to their words. I envied the fact that strangers would meet at parties and quickly find common bonds like schools and friends or having grown up in small towns in states whose names I never even heard before. Most of all, I became annoyed that my sentences began with “Back home,” and “In my country,” both introductions that would result in minds wandering off to the strange place I was describing, one they would never know but that for me was the only resounding truth I couldn’t leave, at least not for this place that couldn’t understand what I was saying. I found comfort in the warm arms that saved me from my first brutal winter that coerced me to accept a down jacket I felt was unnecessary and made me look like Kenny from South Park. I appreciated her straight face when I asked how to work the shower, her humorous shrug when I shrunk my first cashmere sweater, and her helpfulness when I created a kitchen bubble bath by using dish soap in the dishwasher. I joined the subculture of new immigrants who said little and worked without complaint in the backs of kitchens and offices. I decided it was better to pretend I had nothing to say than to voice an opinion that was unpopular, or worse, incomprehensible. Instead I spent my time watching tongues and lips mouth words, laughing at punch lines I said under my breath in a perfectly fake American accent. I rushed to get a seat beside gossiping Filipino nannies on the train just to feel like I could hear and be heard in this strange, universal standard of a country I kept insisting was my home. The awkward silences remained season after season, and then decreased year after year. Before long I found jobs in the frontlines and could participate in political discussions thanks to spending all my non-speaking time reading online news and the NYT Magazine. In interactions I had answers to the most meaningless how-are-yous? and began to be able to describe neighborhood changes and my interactions with crazies throughout the years. I racked up enough days to recall a time when tomatoes were 69 cents a pound (they are now $2.69), and how hard it was to quit smoking when they raised packs to $5.90 (they are now $11). Most of all I still shared a life with the reason I dropped out of my world and became mute for several years. To that reason I added many, many more, and realized that it is not race nor geography, but time and what you contribute, and how hard you work for your dreams that makes you finally and fully assimilated. That, and finally having a voice that is heard. 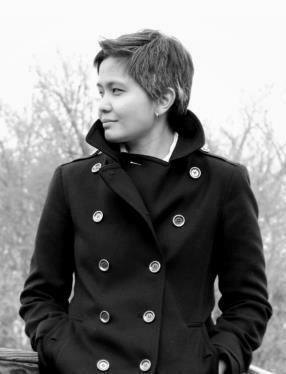 Shakira Sison writes fiction, essays, poetry, and blogs about food, travel and art. She lives in Brooklyn and will be celebrating her tenth year as a New Yorker this year. Just a quick line to let you know how much I enjoyed your post. It made me think back on my first few months of actually living in the US despite having been here twice before. I didn’t think I was going to last. Unmet expectations, immersion into totally new culture despite what you referred to as being raised on American television, moments of uncertainties, self-doubts, etc. etc. etc. And then I figured it all out. All of “us” who came here to stay has to have gone through all of what you have described in your post. What helped me a lot is to keep an open mind, refrain from judgments, avoid comparisons and I was on the road to a less conflict-free living. Oh, and I try to see everyone as going through their own personal issues which made me feel a lot better. Not because of their issues, LOL but my changed attitude. Maybe that wasn’t so quick. I really enjoyed your story, and I can say your observations and comments are true. I will be moving to the mainland few months from now, and thank you for sharing your experience. I hope you can share more stories that will serve as an inspiration to all Filipino immigrants.